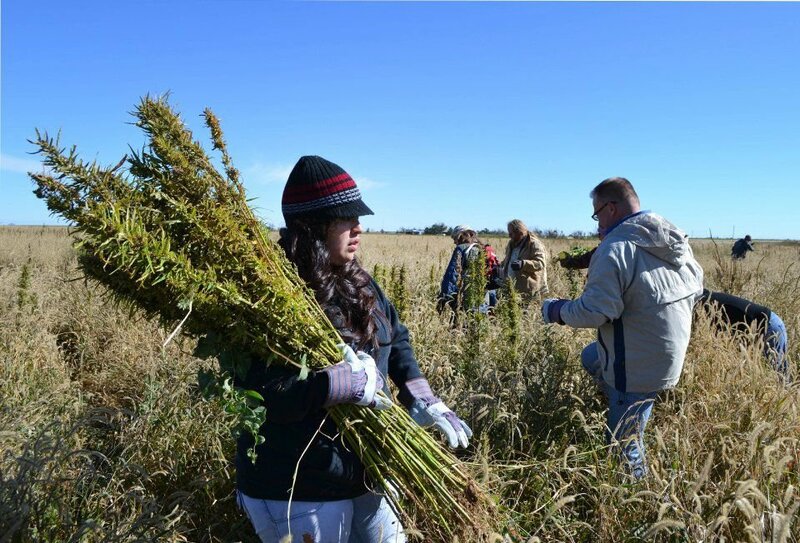 Volunteers harvest hemp in September of 2016 during the first known harvest of the plant in more than 60 years, in Springfield, Colo. A panel at the 27th annual Governor's Forum on Agriculture will look at ranching on federal lands and opportunities in industrial hemp. AP file photo. Global agriculture, both the focus of the TransPacific Partnership and a significant factor in the ongoing negotiations over the North American Free Trade Agreement, will be the focus Wednesday when agriculture leaders from around the state gather in Denver. The 27th annual Governor's Forum on Agriculture will lead off with a discussion of how American agriculture meets global demand and customer expectations. The one-day forum at the Stapleton Renaissance Hotel also will look at the agricultural workforce as a political as well as labor issue. The event is put together by the Colorado Agricultural Leadership Program (CALP), which is celebrating its 13th year. CALP Executive Director Dani Traweek said the global impact segment will look at how the current political environment impacts corporate agriculture, such as JBS, one of the nation's leading producers of pork and beef and the largest cattle feeder in the world. A panel discussion will feature officials from JBS, Molson Coors and Ardent Mills, one of Colorado's newest companies. The panel will discuss the role of technology, pressures to become more environmentally sensitive and the challenges Colorado faces in becoming more competitive in the national and global markets. Another panel will look at ranching on federal lands and opportunities in industrial hemp. Gov. John Hickenlooper will address the state of Colorado agriculture during the event's noon luncheon and participate in a question-and-answer session. U.S. Undersecretary of Agriculture Greg Ibach will also address the global impact of agriculture. CALP is a two-year intensive program that brings participants in from around the state. They learn about agricultural policy, leadership and governance. Alumni include former U.S. Rep. John Salazar of Manassa, Senate President Pro tem Jerry Sonnenberg of Sterling and Rep. Judy Reyher of Swink. This year's class includes an international chef, beef producers, a banker and a greenhouse owner, according to Traweek.